Join us every Friday after the first Jumu’ah (1:15 p.m. to 1:45 p.m.) to re-examine and improve our tafeer, theology, and matters of aqeedah. 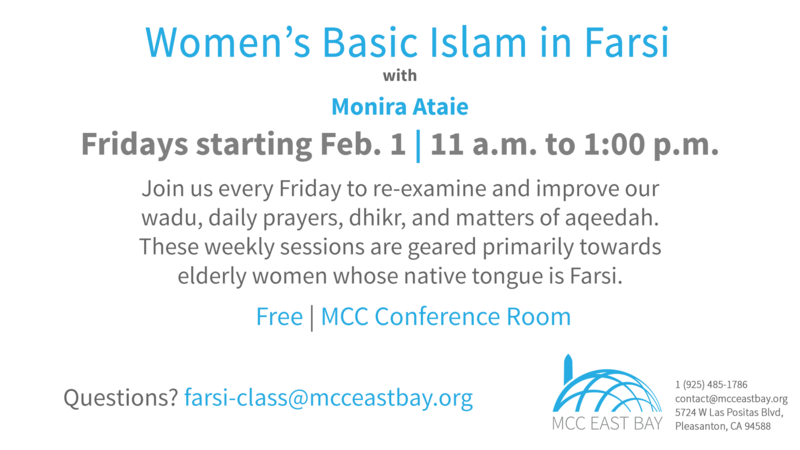 These weekly session are geared towards women whose native tongue is Farsi. Taught in Farsi by Sister Monira Ataie. Free. 2 p.m. to 3:30 p.m. every Friday starting Feb. 1. No registration needed. Class is held in Classroom 1. Snacks provided.